"Mark of the Beast" redirects here. For other uses, see Mark of the Beast (disambiguation). 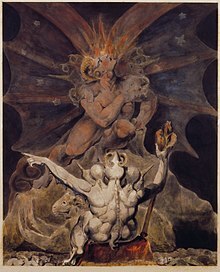 The number of the beast is 666 by William Blake. The Number of the Beast (Greek: Ἀριθμὸς τοῦ θηρίου, Arithmos tou Thēriou) is a term in the Book of Revelation, of the New Testament, that is associated with the Beast of Revelation in chapter 13. In most manuscripts of the New Testament and in English translations of the Bible, the number of the beast is 666. Papyrus 115 (which is the oldest preserved manuscript of the Revelation as of 2017[update]), as well as other ancient sources like Codex Ephraemi Rescriptus, give the Number of the Beast as 616 (χιϛ), not 666; critical editions of the Greek text, such as the Novum Testamentum Graece, note 616 as a variant. The Number of the Beast is described in Revelation 13:15–18. Several translations have been interpreted for the meaning of the phrase "Here is Wisdom, Let him that hath understanding count the number of the beast" where the peculiar Greek word ψηφισάτω (psephisato) is used. Possible translations include "to count", "to reckon" and also "to vote" or "to decide". 17καὶ ἵνα μή τις δύνηται ἀγοράσαι ἢ πωλῆσαι εἰ μὴ ὁ ἔχων τὸ χάραγμα, τὸ ὄνομα τοῦ θηρίου ἢ τὸν ἀριθμὸν τοῦ ὀνόματος αὐτοῦ. 18Ὧδε ἡ σοφία ἐστίν· ὁ ἔχων τὸν νοῦν ψηφισάτω τὸν ἀριθμὸν τοῦ θηρίου· ἀριθμὸς γὰρ ἀνθρώπου ἐστί· καὶ ὁ ἀριθμὸς αὐτοῦ χξϛʹ. 17καὶ ἵνα μή τις δύνηται ἀγοράσαι ἢ πωλῆσαι εἰ μὴ ὁ ἔχων τὸ χάραγμα, τὸ ὄνομα τοῦ θηρίου ἢ τὸν ἀριθμὸν τοῦ ὀνόματος αὐτοῦ. 18ὧδε ἡ σοφία ἐστίν· ὁ ἔχων νοῦν ψηφισάτω τὸν ἀριθμὸν τοῦ θηρίου, ἀριθμὸς γὰρ ἀνθρώπου ἐστίν· καὶ ὁ ἀριθμὸς αὐτοῦ ἑξακόσιοι ἑξήκοντα ἕξ. Although Irenaeus (2nd century AD) affirmed the number to be 666 and reported several scribal errors of the number, theologians have doubts about the traditional reading because of the appearance of the figure 616 in the Codex Ephraemi Rescriptus (C; Paris—one of the four great uncial codices), as well as in the Latin version of Tyconius (DCXVI, ed. Souter in the Journal of Theology, SE, April 1913), and in an ancient Armenian version (ed. Conybeare, 1907). Irenaeus knew about the 616 reading, but did not adopt it (Haer. v.30,3). In the 380s, correcting the existing Latin-language version of the New Testament (commonly referred to as the Vetus Latina), Jerome retained "666". 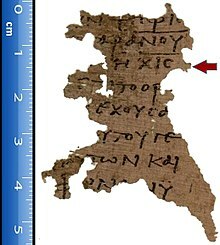 Around 2005, a fragment from Papyrus 115, taken from the Oxyrhynchus site, was discovered at the Oxford University's Ashmolean Museum. It gave the beast's number as 616 χιϛʹ. This fragment is the oldest manuscript (about 1,700 years old) of Revelation 13 found as of 2017[update]. Codex Ephraemi Rescriptus, known before the Papyrus 115 finding but dating to after it, has 616 written in full: ἑξακόσιοι δέκα ἕξ, hexakosioi deka hex (lit. "six hundred and sixteen"). Papyrus 115 and Ephraemi Rescriptus have led some scholars to regard 616 as the original Number of the Beast. According to Paul Louis, "The number 666 has been substituted for 616 either by analogy with 888, the [Greek] number of Jesus (Gustav Adolf Deissmann), or because it is a triangular number, the sum of the first 36 numbers (1+2+3+4+5+6+...+36 = 666)"
Using gematria to calculate the number of a world leader’s name, in order to match it with the number of the beast. Associating the number of the beast as the duration of the beast’s reign. Corresponding symbolism for the Antichrist and antichristian power. In Greek isopsephy and Hebrew gematria, every letter has a corresponding numeric value. Summing these numbers gives a numeric value to a word or name. The use of isopsephy to calculate "the number of the beast" is used in many of the below interpretations. Preterist theologians typically support the numerical interpretation that 666 is the equivalent of the name and title Nero Caesar (Roman Emperor 54–68 AD). Written in Aramaic, this can be valued at 666 using the Hebrew numerology of gematria, and was used to secretly speak against the emperor. Also "Nero Caesar" in the Hebrew alphabet is נרון קסר‎ NRON QSR, which when used as numbers represent 50 200 6 50 100 60 200, which add to 666. The Greek term χάραγμα (charagma, "mark" in Revelation 13:16) was most commonly used for imprints on documents or coins. Charagma is well attested to have been an imperial seal of the Roman Empire used on official documents during the 1st and 2nd centuries. In the reign of Emperor Decius (249–251 AD), those who did not possess the certificate of sacrifice (libellus) to Caesar could not pursue trades, a prohibition that conceivably goes back to Nero, reminding one of Revelation 13:17. Preterists argue that Revelation was written before the destruction of the Temple, with Nero exiling John to Patmos. Most scholars, however, argue it was written after Nero committed suicide in AD 68. The Catholic Encyclopedia has noted that Revelation was "written during the latter part of the reign of the Roman Emperor Domitian, probably in A.D. 95 or 96". Additional Protestant scholars are in agreement. Because some believe Revelation 13 speaks of a future prophetic event, "All who dwell on the earth will worship him, whose names have not been written in the Book of Life of the Lamb slain from the foundation of the world." (Revelation 13:8 NKJV), some have argued that the interpretation of Nero meeting the fulfillment is an impossibility if Revelation was written around 30 years after the death of Nero. However, rumors circulated that Nero had not really died and would return to power. It has also been suggested that the numerical reference to Nero was a code to imply but not directly identify emperor Domitian, whose style of rulership resembled that of Nero and who put the people of Asia (Lydia), whom the Book of Revelation was primarily addressed to at the time, under heavy taxation. The popular Nero Redivivus legend stating that Nero would return to life can also be noted; "After Nero's suicide in AD 68, there was a widespread belief, especially in the eastern provinces, that he was not dead and somehow would return (Suetonius, LVII; Tacitus, Histories II.8; Dio, LXVI.19.3). Suetonius (XL) relates how court astrologers had predicted Nero's fall but that he would have power in the east. And, indeed, at least three false claimants did present themselves as Nero redivivus (resurrected). An Aramaic scroll from Wadi Murabba'at, dated to "the second year of Emperor Nero", refers to him by his name and title. In Hebrew it is Nron Qsr (pronounced "Nerōn Kaisar"). In Latin it is Nro Qsr (pronounced "Nerō Kaisar"). In the 1923 book The Number And Names Of The Apocalyptic Beasts, David Thom rejects "Maometis" as a valid translation, observing that "of the seven different ways in which Muhammad’s name is written in Euthymius and the Byzantine historians, not one is the orthography in question". None of the given spellings add up to 666 under Greek gematria. The Classical Greek word charagma (χάραγμα), translated as mark (of the beast) in Revelation 13:16 can also mean any mark engraved, imprinted, or branded; stamped money, document, or coin. A common preterist view of the Mark of the Beast (focusing on the past) is the stamped image of the emperor's head on every coin of the Roman Empire: the stamp on the hand or in the mind of all, without which no one could buy or sell. New Testament scholar Craig C. Hill noted, "It is far more probable that the mark symbolizes the all-embracing economic power of Rome, whose very coinage bore the emperor's image and conveyed his claims to divinity (e.g., by including the sun's rays in the ruler's portrait). It had become increasingly difficult for Christians to function in a world in which public life, including the economic life of the trade guilds, required participation in idolatry." Adela Yarbro Collins further denotes that the refusal to use Roman coins resulted in the condition where "no man might buy or sell" (Rev. 13:17). A similar view is offered by Craig R. Koester. "As sales were made, people used coins that bore the images of Rome's gods and emperors. Thus each transaction that used such coins was a reminder that people were advancing themselves economically by relying on political powers that did not recognize the true God." In 66, when Nero was emperor—about the time some scholars say Revelation was written—the Jews revolted against Rome and coined their own money. The passage is also seen as an antithetical parallelism to the Jewish institution of tefillin—Hebrew Bible texts worn bound to the arm and the forehead during daily prayer. Instead of binding their allegiance to God to their arm and head, the place is instead taken with people's allegiance to the beast. The idealist perspective on the Number of the Beast rejects gematria, envisioning the number not as a code to be broken, but a symbol to be understood. Idealists would contend that because there are so many names that can come to 666 and that most systems require converting names to other languages or adding titles when convenient, it has been impossible to come to a consensus. Given that numbers are used figuratively throughout the book of Revelation, idealists interpret this number figuratively as well. The common suggestion is that because seven is a number of completeness and is associated with the divine, that six is incomplete and the three sixes are "inherently incomplete". The number is therefore suggestive that the Dragon and his beasts are completely inadequate. Another suggestion is that this number represents an individual's incomplete or immature spiritual state. A futurist view of the Mark of the Beast is that the rise of a supranational currency (for example, the euro) could be a hallmark of the End Times and that the Mark of the Beast will be a sign on the forehead or on the right hand. Futurists (focused on the future) believe that the Revelation addresses primarily the Second Coming of Christ and similar events at the time's end (1:7; 19:11–16; 22:11–12). Although many do find truth in these general assertions, this view does not take into account all historical views. (Ch. 2–5; 12:5–16). Religious difficulties with a world currency currently exist. According to the futurist view, to overcome the extant difficulties the Antichrist will use forced religious syncretism (i.e. amalgamations of different religions in the name of counterterrorism and world economic stability) to enable the creation of the currency. Some interpret the mark as a requirement for all commerce to mean that the mark might actually be an object with the function of a credit card, such as RFID microchip implants. In Christianity, some believe the implantation of chips may be the imprinting of the Mark of the Beast, prophesied to be a requirement for all trade, and a precursor to the events of the second half of the Book of Revelation. Historicists believe Revelation articulates a full range of the history of the Christian church, from John's day to the Second Coming of Christ. The author alludes to Daniel 2:28 and 45; Daniel's vision (Daniel 2) uses symbols giving a sequence of future events in history, from the Babylonian empire, through Medo-Persian period, Greece and Rome continuing until the end of the current civilization. This apocalyptic volume builds on Daniel's approach focusing on major points of Christian history: the cross of Christ (Rev. 5:6,9,12); the Second Coming (Rev. 14:14-16; 19:11-16); the 1,000 years in heaven (Rev. 20:4–6); the third advent of Christ to earth along with his loyal followers and the destruction of Satan and those who refused Christ (20:7–15); and the creation of a new heavens and a new earth where death, sorrow, and sin cease and God dwells with His people (Rev. 21:1–8, 22–27; 22:1–5). The Book of Daniel is divided into two parts—the historical narrative of the captivity of Judah and the prophecies pointing to both promised Messiah and the events of the end of the world. Attention to the text of Revelation aids the student of Bible prophecy by showing how the Apostle John and Jesus intended us to interpret Bible apocalyptic literature as found in Daniel. Seventh-day Adventists taking this view believe that the Mark of the Beast (but not the number 666) refers to a future, universal, legally enforced Sunday-sacredness. "Those who reject God's memorial of creatorship—the Bible Sabbath—choosing to worship and honor Sunday in the full knowledge that it is not God's appointed day of worship, will receive the 'mark of the beast.'" "The Sunday Sabbath is purely a child of the Papacy. It is the mark of the beast." Jehovah's Witnesses believe that the beast identified by the number 666 represents the world's unified governments in opposition to God. The beast is said to have "a human number" in that the represented governments are of a human origin rather than spirit entities. The number 666 is said to identify "gross shortcoming and failure in the eyes of Jehovah", in contrast to the number 7, which is seen as symbolizing perfection. In 1989, Nancy and Ronald Reagan, when moving to their home in the Bel-Air section of Los Angeles after the 1988 election, had its address—666 St. Cloud Road—changed to 668 St. Cloud Road. In 2003, U.S. Route 666 in New Mexico was changed to U.S. Route 491. A New Mexico spokesperson stated, "The devil's out of here, and we say goodbye and good riddance." The phobia has been a motif in various horror films such as The Omen and its 2006 remake, and in music albums such as Iron Maiden's The Number of the Beast. The Number of the Beast also appears in other films such as Pulp Fiction, The Doom Generation, End of Days, Bedazzled, and The Phantom of the Opera. Some women expressed concern about giving birth on June 6, 2006 (6/6/06). In November 2013, Codie Thacker—a cross-country runner at Whitley County High School in Williamsburg, Kentucky—refused to run in her Kentucky High School Athletic Association regional meet, forfeiting a chance at qualifying for the state championships, when her coach drew bib number 666. In 2015, US Representative Joe Barton had the number of a legislative bill he had introduced changed from 666 to 702 because "the original bill number carried many different negative connotations", according to a spokesperson. In 2017, church leaders in Papua New Guinea were concerned by newspaper reports that the Governor-General had been requested to sign 666 writs for an upcoming election. They were reassured by the Electoral Commissioner that the number merely reflected 6 copies of each writ for 111 electorates. In October 2017, flight AY666 from Copenhagen to Helsinki (HEL) departed for the last time before being renamed. Since 2006, the flight had been scheduled on a Friday the 13th on 21 occasions. Although a Finnair spokesperson said that the number has not been renamed due to superstitious passengers, the flight has nonetheless been renamed to AY954. ^ a b "Papyrus Reveals New Clues to Ancient World". News.nationalgeographic.com. Archived from the original on 10 January 2008. Retrieved 31 March 2014. ^ Novum Testamentum Graece, Nestle and Aland, 1991, footnote to verse 13:18 of Revelation, page 659: "-σιοι δέκα ἕξ" as found in C [C=Codex Ephraemi Rescriptus]; for English see Metzger's Textual Commentary on the Greek New Testament, note on verse 13:18 of Revelation, page 750: "the numeral 616 was also read ..."
^ Aland, Kurt (1983). The Greek New Testament (Third ed.). Stuttgart: United Bible Societies. p. 892. ISBN 3-438-05111-7. ^ "Revelation 13:18". Stephanus New Testament. Bible Gateway. Archived from the original on 1 March 2007. Retrieved 22 June 2006. ^ "Revelation 13:18". Westcott-Hort New Testament. Bible Gateway. Archived from the original on 3 December 2007. Retrieved 22 June 2006. ^ "Revelation 13:18". Codex Alexandrinus. Center for the Study of New Testament Manuscripts. Archived from the original (JPEG) on 23 March 2006. Retrieved 22 June 2006. ^ "Revelation in the 26th/27th edition of the Novum Testamentum Graece". Sacred-texts.com. Archived from the original on 23 August 2014. Retrieved 30 April 2014. ^ Hoskier, Herman C. (1929). Concerning the Text of the Apocalypse: A complete conspectus of all authorities (vol. 2 ed.). p. 364. ^ sources, translated from the original languages with critical use of all the ancient (2005). The Catholic youth Bible: New American Bible including the revised Psalms and the revised New Testament (Rev. ed.). Winona, Minn.: Saint Mary's Press. ISBN 978-0-88489-798-9. Archived from the original on 24 October 2017. ^ Just, Felix (2 February 2002). "666: The Number of the Beast". Archived from the original on 13 June 2006. Retrieved 6 June 2006. ^ Understanding the book of revelation by dr. terri lewis - He along with other scholars note that Revelation was written about 95 AD. ^ Your Study of the New Testament Made Easier Part 2: Acts Through Revelation, By David J. Ridges p. 409 - states "The book of Revelation was written by the Apostle John about AD 95"
^ An introduction to the New Testament and the origins of Christianity By Delbert Royce Burkett, p.510. Books.google.com. Retrieved 30 April 2014. ^ Encyclopedia of prophecy By Geoffrey Ashe, p.204. Books.google.com. Retrieved 30 April 2014. ^ From every people and nation: the book of Revelation in intercultural perspective, p.193. Books.google.com. Retrieved 30 April 2014. ^ "Nero as the Antichrist". Penelope.uchicago.edu. Retrieved 30 April 2014. ^ a b Hillers, D. R. (1963). Revelation 13:18 and A Scroll from Murabba'at. BASOR, 170. p. 65. ^ The Gentleman's Magazine, Volume 10. Retrieved 31 March 2014. ^ The contribution of British writers ... - Google Books. Books.google.ca. 1983. ISBN 978-3-16-144497-5. Retrieved 17 July 2010. ^ Tufts university digital library, Greek to English lexicon "Archived copy". Archived from the original on 1 February 2015. Retrieved 23 January 2015. CS1 maint: Archived copy as title (link). ^ "Collins, 1984, p. 126: Adela Yarbro Collins: "The juxtaposition of buying and selling with the mark of the beast refers to the fact that Roman coins normally bore the image and name of the current emperor. "The inability to buy or sell would then be the result of the refusal to use Roman coins." ^ Stan Campbell; James S. Bell (2001). The Complete Idiot's Guide to the Book of Revelation. Alpha Books. pp. 212–213. ISBN 978-0028642383. ^ Beale, Gregory K. (1999). The Book of Revelation: A Commentary on the Greek Text. Grand Rapids, Michigan: Wm. B. Eerdmans Publishing. p. 722. ISBN 080282174X. Retrieved 9 July 2012. ^ "Here Comes the Beast (Revelation 13:1–18)". Bible.org. Archived from the original on 11 August 2010. Retrieved 11 August 2010. ^ Andrews Study Bible. p. 1659. ^ "Verse-by-Verse Commentary by Dr. Grant C. Richison". Versebyversecommentary.com. 31 December 1998. Archived from the original on 18 September 2010. Retrieved 11 August 2010. ^ Scheeres, Julia (25 November 2003). "When Cash Is Only Skin Deep". Wired News. wired.com. Archived from the original on 4 April 2004. Retrieved 25 November 2003. ^ "Revelation 14:9–11". Bible Gateway. Archived from the original on 13 March 2010. Retrieved 3 July 2010. ^ Albrecht, Katherine; McIntyre, Liz (31 January 2006). The Spychips Threat: Why Christians Should Resist RFID and Electronic Surveillance. Nelson Current. ISBN 9781418551759. Retrieved 31 March 2014. ^ Baard, Mark (6 June 2006). "RFID: Sign of the (End) Times?". Wired.com. Archived from the original on 28 October 2009. Retrieved 13 October 2009. ^ Dybdahl, jon (2010). Andrews Study Bible. Berrien Springs: Sutherland House. p. 1659. LCCN 2010924514. ^ "Advent Review, Vol. I, No. 2, August, 1850". christiansermonsandmusicvideos.com. Archived from the original on 4 March 2016. ^ Research Department of the Universal House of Justice (7 January 1986). "Interpretation of Biblical Verses". Bahá'í Library. Archived from the original on 17 May 2007. Retrieved 16 May 2007. ^ "Student Resources, Chapter 12: The First Global Civilization: The Rise and Spread of Islam, The Arab Empire of the Umayyads - Converts and "People of the Book"". Occawlonline.pearsoned.com. Archived from the original on 15 July 2011. Retrieved 11 August 2010. ^ "Identifying the Wild Beast and Its Mark". The Watchtower. 1 April 2004. Archived from the original on 3 November 2014. Retrieved 3 November 2014. ^ "THE REAGANS: First Family Easing Into Private Life". Los Angeles Times. 19 November 1988. ^ Linthicum, Leslie (31 July 2003). "It's Now US 491, Not US 666". Albuquerque Journal. Archived from the original on 5 December 2008. ^ Allen-Mills, Tony (30 April 2006). "Mothers expect Damien on 6/6/06". London: The Sunday Times. Archived from the original on 12 January 2008. ^ "Whitley County Cross Country Runner Refuses To Run After Being Assigned "666" Number". Lexington, Kentucky: WLEX-TV. 4 November 2013. Archived from the original on 7 November 2013. Retrieved 6 November 2013. ^ Barron-Lopez, Laura (2 February 2015). "Republican avoids apocalyptic 666". The Hill. Archived from the original on 10 March 2015. ^ Julia Buckley (13 October 2017). "Finnair's flight 666 to HEL makes its last Friday the 13th run today". The Independent. Archived from the original on 23 January 2018. Beale, G.K. (1999). Revelation : a commentary on the Greek text (3. Dr. ed.). Grand Rapids, MI: W.B. Eerdmans. ISBN 978-0-8028-2174-4. Cory, Catherine A. (2006). The Book of Revelation. Collegeville, Minn.: Liturgical Press. ISBN 978-0-8146-2885-0. Garrow, A.J.P. (1997). Revelation. London. : Routledge. ISBN 978-0-415-14641-8. Haines, C. Marvin Pate & Calvin B. (1995). Doomsday delusions: what's wrong with predictions about the end of the world. Downers Grove, Ill.: InterVarsity Press. ISBN 978-0-8308-1621-7. Parker, David C. (2009). Manuscripts, texts, theology: collected papers 1977-2007 ([Online-Ausg.]. ed.). Berlin: Walter de Gruyter. p. 73. ISBN 978-3-11-021193-1. Stewart, Bart D. Ehrman & Daniel B. Wallace in dialogue; Robert B. (2011). The reliability of the New Testament. Minneapolis: Fortress Press. ISBN 978-0-8006-9773-0.